A neighbourhood favourite and familiar stomping ground for many, the Queen of Hoxton is an iconic bar located at the heart of ever-trendy Shoreditch. Well known for its chameleonic nature, the establishment’s gorgeous roof terrace is undergoing one of its famous seasonal makeovers, to be ready for summer 2018. Following on from the success of their wintery Moroccan Medina, the Queen of Hoxton is taking things to a whole new level with the launch of ‘Lost Vegas’ – a vine-covered utopian version of America’s capital of casinos. Set after a national uprising that they’re calling ‘Trumpageddon’, this not-so-alternative future is set to transform the average drinking experience. The year is 2030, the naturalists and eco-warriors have risen against the tyranny of twenty-first century America and have restored natural order with humans booted from the spot of automatic alpha. Animals of all shapes and sizes roam the land freely, and Las Vegas, the ultimate symbol of greed, lust and capitalism, has long been abandoned. In its place ‘Lost Vegas’ has risen from the ashes of consumerism – an overgrown utopia that has been reclaimed by nature and repurposed by the eco-centric tribe that originally sparked the revolution. An abandoned school bus serving vegan hot dogs, an overgrown wedding chapel (Elvis impersonator included) and a massive ‘Welcome to Las Vegas’ sign help to set the scene, along with oil drums and twisted slot machines dispensing anything from boozy ice lollies to divorce certificates. Never one to offer up a half-baked experience, the Queen of Hoxton is really running with the eco-friendly theme. Hosting workshops, lectures and theatrical experiences, the entire summer will be spent educating people about the importance of sustainable living. Fret not though, for the eco-warriors of tomorrow haven’t forgotten how to throw a legendary party. 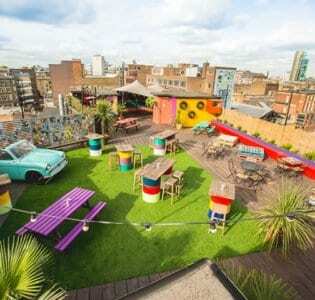 The Lost Vegas rooftop experience launches May 3rd 2018 at the Queen of Hoxton and will run until October 2018.